Following the protest by Thamizhar Munetra Padai (TMP) against Rajinikanth's probable entry in politics, many supporters of the superstar took to the streets in Washermanpet to support him. 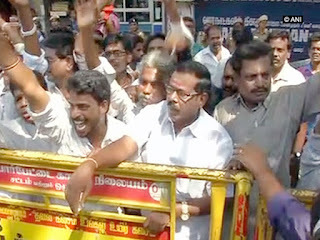 Yesterday, TMP headed by their leader Veeralakshmi took out a rally towards the Poes Garden residence of actor Rajinikanth condemning his alleged move to enter politics. They raised slogans against the actor claiming that they did not want an actor, who came to Tamil Nadu from Karnataka to rule them. The police then stopped them on the Cathedral Road, less than a kilometre from the actor's residence. The protestors burnt the effigy of the actor when they were stopped by the police on the Cathedral Road. The city police detained at least 30 members of the TMP.